Feel at ease in this 2 story 2800 sq.ft. Sunriver home. Located just a short distance to the Market Place grocery store. This professionally decorated executive home provides two master suites. It is perfect for your family or large group. Providing 5 bedrooms and 4 bathrooms with excellent separation of space. This property will permit privacy but also offers two large gathering areas to promote good times. Enjoy the hot tub, cruise the bike paths or just simply relax with friends and family. Come, enjoy and make lots of great memories! Amenities: Air Conditioning, hot tub, flat screen TV's, foosball, ping pong, WiFi, gas BBQ, bikes, pets allowed. Kitchen remodeled in 2015 to include new stainless steel appliances, granite counter tops & more! Bikes: There are 8 bikes at this home (8 adult). However, we do recommend bringing your own bikes whenever possible as bikes are not guaranteed, subject to change w/out notice and subject to downtime. Should you arrive and a bike is in need of repair, please notify our office and we will make every attempt to have it repaired. In addition, we do provide discounts for bike rentals at a few of our local shops. Bed Configuration: King/King/Queen/Queen/2 Twins/Sofa Sleeper in family room. SHARC Access 2019 - Free Unlimited: This home provides for 10 free unlimited access SHARC passes available for pick up at check in. You save $25 per person, per visit. SHARC Aquatic & Recreation Center - From year-to-year Mountain Resort Properties' homes opt-in, or out, of access for the Aquatics Park! Please note that just because a home has access one year, does not guarantee it will have access the next year. 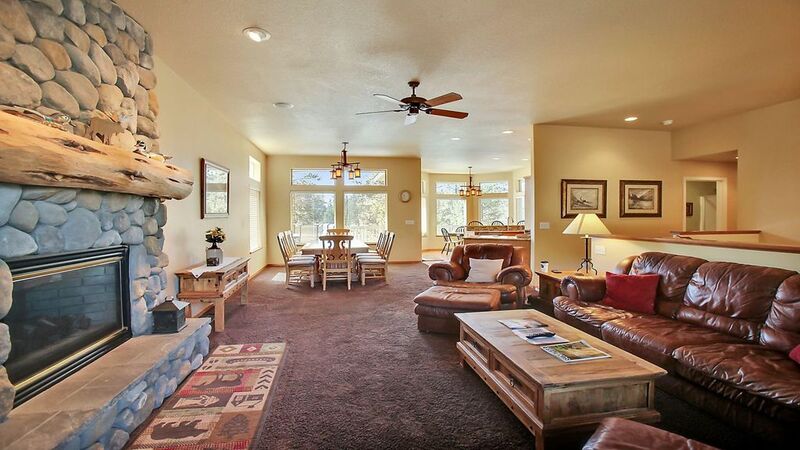 You can view property description to determine if SHARC access is provided for specific Sunriver vacation rental. Listed below are just a few of the things the SHARC facility will provide to guests holding passes: •• Outdoor / Indoor Pools •• Hot Tub •• Lazy River •• Water Slides •• Toddler Pool •• Outdoor Basketball Court •• Sand Play Area •• Sledding Hill •• Much More! PLEASE NOTE: All prices listed on the site are for the rent only. For a complete quote that includes all Applicable Taxes/Fees, click "VIEW DETAILS" just below total price. Lots of space, clean and bright. We enjoyed the time at sunriver. The large dining room table not only sat everyone for meals but allowed us to play plenty of board games. There were enough TVs for the football games and also the DVDs. The Sharc passes were nice for the few warm days we could use them. The hot tub was nice to soak in after bike rides hiking sight seeing or walking the trails. I was extremely impressed that Mountain Resort front office addressed our two concerns (clogged shower and not enough room for garbage) so quickly. There is plenty of room for 12 people and 2 dogs. Thank you. 5 Belknap was clean and spacious for our family with young adult children of 9 in total. Property was well equipped upon arrival with all of the bikes in working order. Nice large outdoor deck and working Weber BBQ made for enjoyable outdoor dining. Living room TV could use some instructions given you have 6 controllers and some beach towels for the SHARC center would be nice. Carpet is a little dated, but all in all a nice property. Great place to rendezvous with our California family! This house was perfect for three families with kids! Plenty to do and all the amenities. We would stay again for sure! We loved this house! Lots of bedrooms. Fantasy game room. Nice bikes for use. Conveniently close to the north store. And dog friendly!